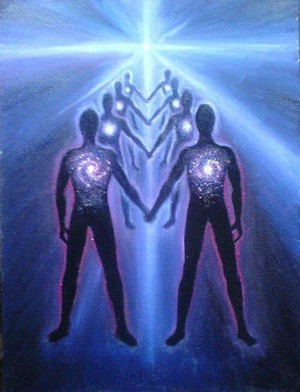 Among the many important messages from near death experiences (NDEs), the one thing that stands out is the sensing of the Universal Connectivity between all manifestations. This is in contrast to the individuation which currently drives the human psychology on this planet. In the analytic psychology of C. G. Jung (Ref. 1), individuation is defined as the process by which the self is formed by integrating elements of the conscious and the unconscious mind. This identification is a result of two things: 1. Limited awareness and 2. the Instinct of self-preservation in living beings. When awareness expands, we sense the source of this limited self and talk about the Universal Self. In Sanatana Dharma, the ancient philosophy of India, this Universal Self is called the Purusha – the source of all manifestations in the universe. Purusha is like a primordial fire from which many sparks leave, get embroiled with the nature and, at the culmination of their awareness, rejoin the flame to complete the cycle. Carl Sagan, the noted astrophysicist, writes in his book ‘Cosmos’ that only a cyclic process can be eternal. In the early stages of development, human beings must have thought that the moon is self-luminant and that moonlight emanates from it. With widening awareness, they understood that it is actually the sunlight reflected by the moon. This metaphor can be used to explain the relationship between the limited self (the moon) and the Universal Self (the sun). During the NDE, the human being is temporarily thrown into the Universal Consciousness and, hence, feels the source of all things. That is the basis for sensing the connectivity between all beings during the expansive awareness. In the next paragraph, we see the expression of an NDEer (Lori, E; nderf.org) about this connectivity. The above perceptions are a far cry from that of the habitual neurology in which the present humanity is caught. The very fact that sectarian practices are thriving and creating serious conflicts among the various groups indicates that the connectivity mentioned above is expressly denied by them. What is needed is a revolution in the outlook of people which is currently being guided by individuation – both in pampering the ego at the level of a person and, at the level of groups, in being at logger heads with each other through identification with a nation, belief system etc. Many Enlightened Masters – like Krishna, Buddha, Jesus Christ, to name a few – have come and gone but, as of now, the universal connectivity is sensed only by a very small part of the human population. In that respect, the current research on near death experiences has been playing a supportive role to that of the Masters. The Sanskrit word ‘Athma’ is usually translated as ‘Soul’ in English. However, there is a lot of difference between the content of those words. While ‘Athma’ is considered a spark of the Divine and so is the same in all beings, the ‘Soul’ is meant to mean a separate entity identified with each person. For the ‘Soul’ the individuation applies. That is how they can talk about a particular ‘Soul’ going to eternal heaven or hell maintaining its separate identity. In contrast, the ‘Athma’ has no separate identity. At nirvana or liberation, the spark rejoins the flame whence it came. It is like the space in a pot merging with the expansive space outside when the pot is broken; the inner space has always been of the same nature as the outer space but the pot, by its shape, gave it an illusory identity. Thus, the ancient philosophy of Sanatana Dhrama has emphasized the connectivity between all beings through the quality of oneness at their essence. Truth has to be universal and cannot be the exclusive property of any sectarian group. Connectivity also being universal, it can chime in with Truth. Reflections on this matter of connectivity and the associated oneness can lift us to higher levels of esoteric perception. That would make us look at all beings with respect and dignity, leading to global unity and a caring humanity. The joy of global cooperation and international camaraderie would become a day-to-day reality. Harmony and joy would then reign on this wonderful planet. Related matters are covered in the author’s website. The Author: T.C. Gopalakrishnan was born in Madras (now Chennai), India, in 1941. He received his doctoral degree in Coastal Engineering from the North Carolina State University, Raleigh, NC, USA in 1978. He served on the research and teaching faculty of the Indian Institute of Technology, Madras, India, the North Carolina State University and the Kuwait Institute for Scientific Research, Kuwait. Aside from his professional involvements, he was interested in the philosophic issues of life for the last forty years or so. This led him to the messages of Ramana Maharishi, Lao Tzu, J Krishnamurthy, UG Krishnamurthy, Nisargadatta Maharaj, Eckhart Tolle, Marcus Aurelius and similar Masters. His book entitled ‘In Quest of the Deeper Self’ is the outcome of his reflections on those and his wish to share the outcome with others. Gopalakrishnan is a member of the International Association for Near Death Studies. He presented a paper at the 2011 conference of the International Association for Near Death Studies, Durham, NC, USA. Functions as a freelance counselor for peaceful living. He lives in Kodaikanal, a hill town in south India, with his family. Now he and his wife are both retired and currently involved in developing a fruit farm at a village 20 km from their residence. Following this article’s initial publication articlesbase.com has undergone some changes. The original links have been left intact. Next Next post: Religious people have a brain so why don’t some use it? This is reminiscent of something you would write Mike. It echoes my own thoughts. I like the “universal oneness” message. I believe that if people understood the spiritual connectedness that exists between all human spirits, we might be inclined to release the negative thoughts and emotions that drive us to mistreat each other. I often hear talk from people about bringing a “universal love” message to the world. Let me say that if you try push your personal believe system on a world that does not want it, you will become angry and frustrated. Your well-intentioned plan to promote this wonderful ideology will turn into a self-righteous crusade to create heaven on Earth. Our egos always get in the way of our good intentions. I’m not going to say that humans are morally corrupt. I want to maintain a positive attitude. 🙂 I’ll just say that the human ego doesn’t understand power. It equates power with control. It becomes frustrated when other beings obstruct its designs, or it encounters resistance to its ambitions. The ego doesn’t understand love for matter (for the most part). Love is the ultimate lesson for the ego. Self-love should be the first lesson. The ego has trouble with this. More often than not, people feel the need to punish themselves. That’s a major source for many of our physical and mental disorders, including anxiety and depression. Humans love to beat ourselves up over guilt. In its most severe form, we see people who cut themselves. They are called “cutters”. Although cutters sometimes do this for reasons other than self-punishment. This philosophy begins with you recognizing yourself as a member of a vast Soul Family. Most importantly, it should start with your own self-healing. Don’t expect to acquire a correct understanding of the universal love concept if you are continually beating yourself up over misperceived personal flaws and failures. I think you might have to sign up at Tumblr to see its many variations, but it’s good. I’ll have to use it for an article some time. I think a simple message like that can apply to all types of people everywhere. At the same time, I guess we do have to make some kind of informed judgment. It’s a tough call. One’s person’s moral standard is rarely another’s. Some theologians say we can rely on “society” to be the standard for sound moral judgments, especially in times of war. But that’s a questionable argument. There are always bad societal leaders with brainwashed followers. I really think that an adult, spiritually speaking, must carefully consider all the insights that God has given him or her, and try to make the best decisions from there. Some might say that’s radical individualism. And a lot of (apparently) insane people follow a similar, but distorted, idea. So it’s not an easy philosophy. But I believe it’s better than being a mindless follower of a bad ideology—again, providing one is sane and able to make the right choices. One of the subjects you and I have discussed in the past is “discernment”. I put my response to your comment in an article. I felt it was too long to post here. Pingback: Unconditional Love And Spiritual Transformation On Earth. | THE ONENESS of HUMANITY.